Sometimes, we find it hard to make a quick meal that includes all the veggies we need to keep healthy and give us energy. 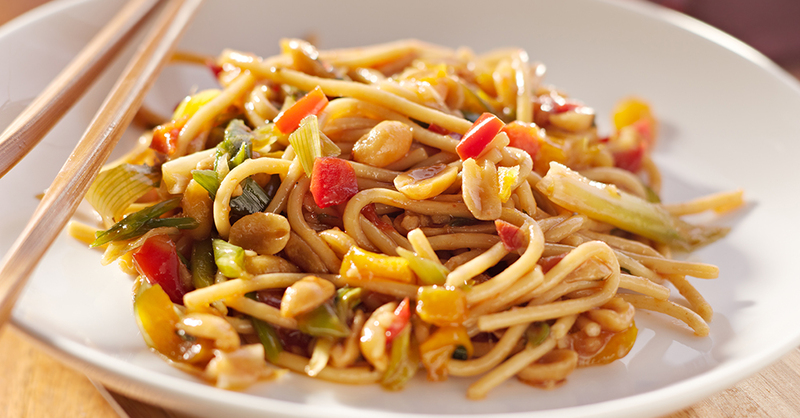 That’s one reason we love this recipe, spicy peanut noodles. It takes less than 20 minutes to prepare and offers tons of flavors from the spices and vegetables. Plus, making this dish with spaghetti noodles lets us use items we already have in the pantry. Depending on our mood, we adjust the amount of Sriracha to control the spiciness, so you can go as wild as you want with it, or skip it completely – it’s up to you! Bring a large pot of salted water to boil and cook spaghetti according to package instructions, or until just al dente. In a large bowl, mix together peanut butter, water, soy sauce, honey and Sriracha until smooth. Then, add lime juice, ginger, garlic and sesame oil, and stir until combined. Place pasta in a large skillet over medium-high heat and pour in the peanut butter sauce mixture. Mix together to coat noodles. Add red peppers, green onions, cilantro, cabbage and peanuts, and cook for 6-7 minutes, or until vegetables have softened.